With no direct news around Ralph Lauren, this could be what's sending shares lower as the company heads into the holiday season. Shares of Ralph Lauren Corporation (NYSE:RL), a global leader in designing, marketing, and distribution of premium lifestyle products spanning apparel, home, accessories and fragrances, are down 5% as of 3:10 p.m. EST. The stock is following other apparel retailers lower Thursday. Today's decline seems to be a continuation of pessimism surrounding many premium retailers, despite many beating estimates in recent quarters. In fact, Ralph Lauren declined 7% in early November after releasing second-quarter results that topped estimates for both the top and bottom lines. Partly behind that decline was the company's inability to drive North American results higher: Comparable-store sales in North America increased 1% in constant currency during the second quarter, despite management ramping up marketing by 30%. Investors should take Ralph Lauren's decline today with a grain of salt and remember that it's actually taking strides with its business. Remember that during the second quarter it grew sales in China by 13% and digital sales by 10%, all while improving adjusted gross margin by 100 basis points to 60.9%. Furthermore, management's "Writing Our Next Great Chapter" strategy should help win a new generation of consumers, drive expansion, improve core products and underdeveloped categories, and increase its digital e-commerce footprint. 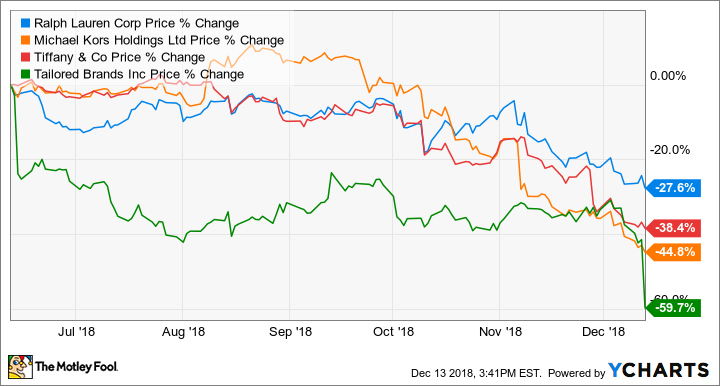 Ralph Lauren is declining today with no real direct news, though uncertainty heading into the holiday season, and a large tumble from another premium apparel retailer, are difficult for some investors to shake off. But they'd be wise to focus on the long-term improvements management is making.